In order to standardize the bases of calculating “replacement cost new” in valuing properties by the Cost Approach to Value, the following annual standard construction costs were recently set forth. This is considered an estimate. Adjustment to specific conditions can be made to suit each property. Costs of constructions are in Baht/sq.metre. The costs consist of costs of building materials for structural, architectural and system works, labour costs, operational costs and contractor's profits as well as the Value Added Tax (VAT) of 7% and professional premiums of 0.96%. No inclusion is extended to interests, project management costs, design, sale costs and the like which are not directly related to the construction. This is an effort which has been conducted on annual basis since 2000. A working group of valuation experts was appointed by the Valuers Association of Thailand to work out costs of these constructions. In 2018, it is expected that other types of buildings will be added onto this standard costs. In addition to costs per sq.metre, the costs will be divided into different stages of construction works such as piling, structure, system works, and architectural finishing. 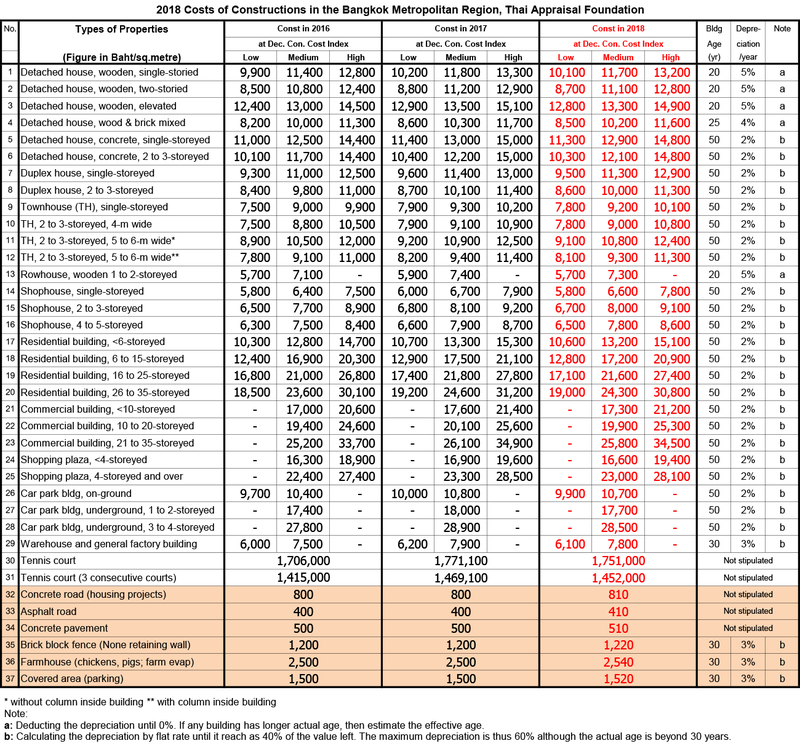 Standard Costs of Construction for valuation purposes was recently announced. Construction costs for wooden housing have increased for some 6% during June 2011 – June 2018. However, for most of the concrete construction with stell as an integral part of the structure, costs were decreased for some 6-8% in the case of tennis courts, on-ground parking lots as well as warehouses. Costs of construction of shophouses and underground parking were decreased for 3-4%. However, in the case of high-rise buildings, prices were decreased insignificantly. During December 2016 - December 2018, most building materials have stayed at the same price except steel which have had an 8% increase in price. However, this will not contribute much to the overall construction prices at large.